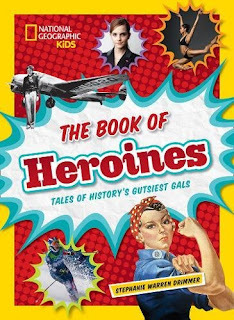 This book is chock-full of Leading Ladies, Daring Dames, Gritty Girls, Peace Heroines, Legendary Ladies, and a few outstanding non-human heroines. These strong girls don't wear capes or have superpowers. But they do share seven qualities, writes Stephanie Drimmer. Heroines step up when help is needed. They are brave. They do the right thing no matter how scared they are. They're confident, even when folks say "you can't do that." Heroines do the right thing. They face risk - which means they act even when doing so means they might be called names, or face danger. And when the going get tough, they don't quit. So who are these real-life heroines Drimmer profiles? One is Eleanor Roosevelt who became the First Lady when F.D.R. was elected President in 1932. She held press conferences and wrote a column about her opinions on social and political issues. She used her position to give a voice to people who didn't have one: women, children, African Americans, and the poor. She challenged stereotypes. One section highlights women who led nations: Golda Meir, Angela Merkel, Margaret Thatcher, Cleopatra. Another introduces athletes. Within the pages are stories of code breakers, warriors, journalists, business leaders, pilots, and explorers. There are profiles of courageous peace-makers, like Malala Yousafzai and Rigoberta Menchu Tum. And there are scientists and inventors. These women pushed against barriers, saved lives, and discovered new worlds. They're the sort of heroes you'd like any child to meet. Review copy from publisher. John Ronald was a boy who loved horses. And trees, And strange sounding words. But most of all, John Ronald loved dragons. If you have a kid who loves dragons, you'll understand this. John Ronald grew up hearing stories about knights and dragons. He and his cousin made up their own language, but he never found dragons. Even when he went to war - and that's where he certainly could have used the help of dragons! So John Ronald went into teaching. And then one day, while grading papers, he started writing: "In a hole in the ground there lived a hobbit." What I like about this book: It's fun to read. 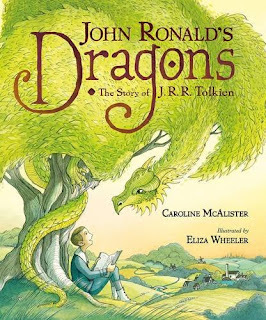 I like that John Ronald had no idea what a hobbit was, but followed him into a story that led him over mountains, beyond the ridges, east of the sun and west of the moon to the land where ... DRAGONS! I also like that the author and illustrator include notes at the end explaining more about Tolkien's life and inspiration for the illustrations. Learn about hobbits! If you haven't read any of JRR Tolkien's books, at least read The Hobbit.Pay attention to their homes, what they wear, food they eat. These are important details. How many kinds of Dragons are there? Like other reptiles, there is great diversity. You may want to make a poster showing all the various kinds of dragons there are or have been in the world. Get to know dragons in the real world. Here's a National Geographic article that tells about seven existing "dragons". Do dragons dance? Chinese New Year celebrations include dragon dances. If you were creating a dragon dance, what would it look like? Today is PPBF (perfect picture book Friday), an event in which bloggers share great picture books at Susanna Leonard Hill's site. She keeps an ever-growing list of Perfect Picture Books. Review ARC from publisher. We have a gift, and we have a cake, and today we're going to drive all the way to the big city to see my new baby cousin. 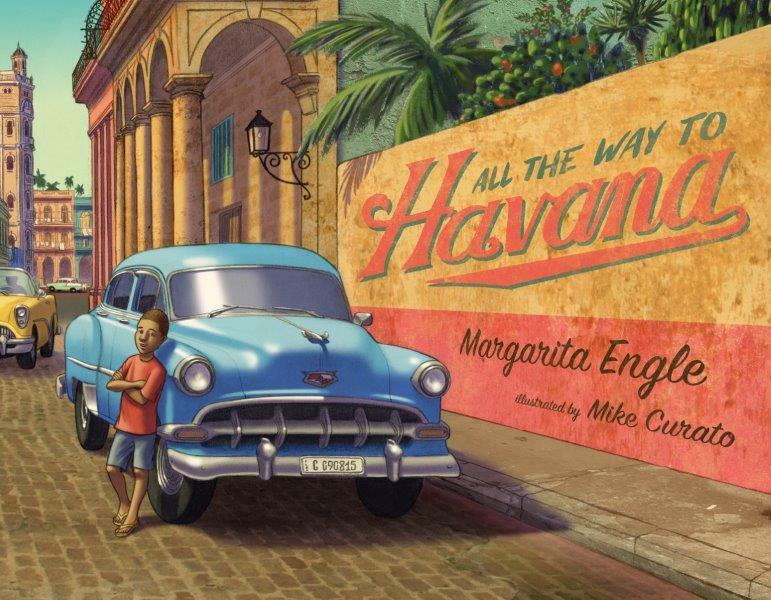 This is the story about a boy and his family driving to Havana, Cuba in their old family car. When she rattles and shakes like a chicken, papa pops the hood and with a twist and a tinker and a bit of twine gets her back in shape. Then it's off to Havana - well, got to give the neighbors a ride. But then it's off to Havana! What I like love about this book: The sounds! So many car sounds, from clunks and clucks to pio pio, taka taka, and a whole lot more zooms and growls. It makes you think, "Hey! that's what MY car sounds like!" I like the repetition of the phrase, "we have a gift, and we have a cake..." I like the way he boy and his father use tools at hand to repair car problems, even inventing their own solution. And I love that Margarita uses her author's note to tell more about why these old American cars are on the island. Plus, if you have a car-loving kid, the end pages are filled with antiques: 1950 Chevy 3100 pickup, 1959 Ford Thunderbird, and my favorite - 1953 Chevy 210 series (a lot like my family's first car). Make a list of the sounds cars and trucks make in your area. Not just on the road, but when they're starting up, and stopped at a light. Don't forget to include a car you ride in frequently. Need inspiration? Here's a library of sounds, and here's the "Car Noise Emporium" from Car Talk. Go to an old car show. The guys with old cars around here have a meet-up every month down in town and anyone can walk by to look at the cars. They raise the hoods and vroom the engines. OR find some books or online sites that have photos of old cars from the 1940s and 1950s. Build a car out of cucumbers, candy bars, or other food you can easily obtain. Think about what makes a good axle and wheels. Test it going down an inclined plane. Then challenge your friends to a race. Here's a fun video of an edible car competition. 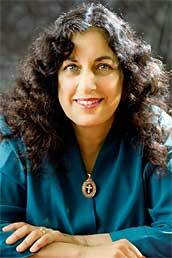 Check out this post by Margarita Engle on writing books that cross borders. Today is PPBF (perfect picture book Friday), an event in which bloggers share great picture books at Susanna Leonard Hill's site. She keeps an ever-growing list of Perfect Picture Books. Review copy from publisher. It's not every day I get two well-known science guys to hang out on my blog. So today I'd like you to welcome Alexander Graham Bell and Sir Isaac Newton. Granted, they lived 200 years apart, but book magic brings them alive today. 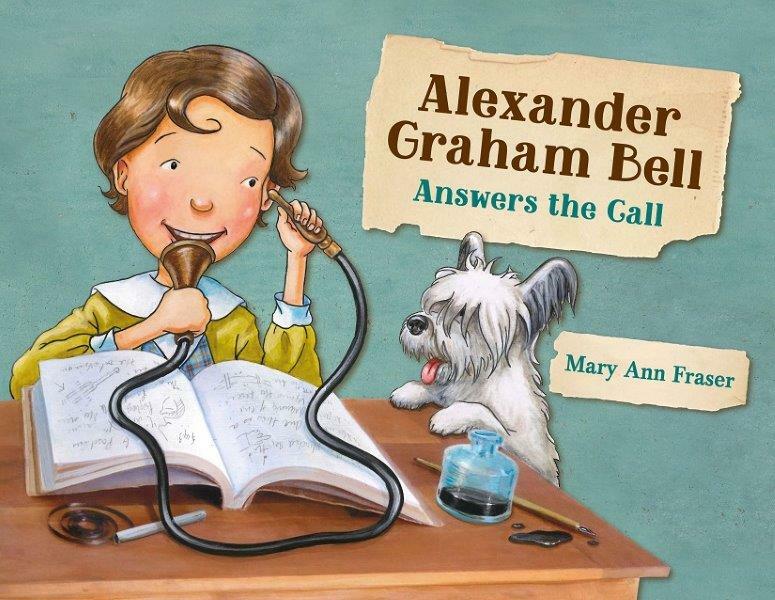 From the beginning, the world all around spoke to Alexander Graham Bell. And he listened. He listened to the hustle and bustle of traffic on the streets, and the sound of the wind blowing through wheat. And because his father was a speech therapist and worked at home, Alec listened to the sounds and chants of the students. Which may have influenced his work as a teacher for the deaf, and his desire to invent a way for people to communicate over long distances. What I like about this book: I love that the end papers show the history of the telephone and the informative charts Mary Fraser drops into the text (one shows how the ear works). And I like how she shows him growing up within a family where hearing and deafness were part of their lives. Fraser shows Alec discovering vibrations and then putting his discovery to use to communicate with his mom. What I like most of all is that the invention of the telephone took time and met with failures along the way. But Alec didn't give up. On Christmas Day over three hundred years ago, in a village in England, a baby was born too early. He was so tiny that no one expected him to live. But he did, and he was immensely curious. While a student, he boarded with the village apothecary. The shelves in the shop were crammed full of jars with fluids and powders, spiderwebs, and leeches. This is where he learned chemistry. One day he was in a jumping competition. Being small, he waited for an extra-strong gust of wind to give him the boost he needed to get the longest jump. So he began his study of physics. He carved sundials, made models, and spent his days thinking - even when he was supposed to do farm work! What I like about this book: It takes us right inside of Newton's life and times. Kathryn Lasky tells us straight out what's true and what's "story". 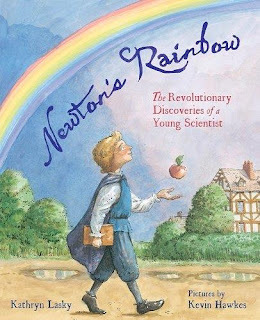 There was an apple, she says, and it did indeed fall - but probably not on Newton's noggin. She helps us see his thought process as he experiments with light and gravity. Make your own telephone. All you need are plastic cups, string, paperclips, and a sharp pencil. Here's how to do it. Test sound waves with a spoon and some string (and maybe a ruler, too). Easy-to-follow instructions and even some ideas for further investigation here. Create a water prism to break sunlight into the colors of the rainbow. All you need is a bowl of water, a small mirror, a sheet of paper, and a sunny window. Here's how to do it. Check out more biographies of scientists over at Archimedes Notebook. Today we're joining the STEM Friday roundup. Drop by STEM Friday blog for more science books and resources. We're also joining others over at Perfect Picture Book Friday, an event in which bloggers share great picture books at Susanna Leonard Hill's site. She keeps an ever-growing list of Perfect Picture Books. Review copies from the publishers.